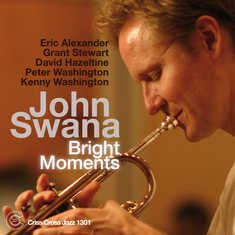 For his tenth Criss Cross date as a leader, trumpeter John Swana presents his first twin-tenor sextet. Swana, tenor saxophonists Eric Alexander and Grant Stewart, pianist David Hazeltine, bassist Peter Washington and drummer Kenny Washington have intersected on many occasions, but never together in a group. The result is an effortless blend of ingrained chemistry with the sound of surprise inherent in first encounters. Like 2005s Philly Gumbo Vol. 2, Bright Moments focuses largely on original material with a couple of standards thrown in for good measure; but the writing is so captivating, the performances so attention-grabbing, that it feels like an album of well-known songs. The ever-inventive Swana creates here challenging contexts for his sextet, with an emphasis on hard-swinging and refined balladry.